Can Marc Jacobs do anything wrong? No. No he cannot. 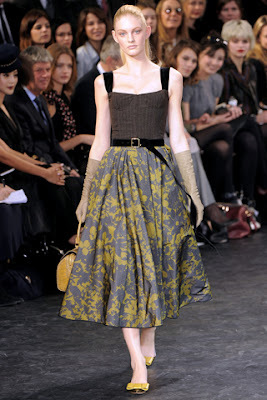 His Fall 2010 Ready-To-Wear collection for Louis Vuitton was absolutely exquisite. With shin-length A-line skirts, fitted blazers, and prim pointed-toe shoes, Marc took us on a trip back to the 50's but with modern-day twists. The show stopper of the collection? This little number in greys, citron, and trimmed in black. If you look at the structure and silhouette of the LV outfit, you'll see it's a page straight out of the 50's. For this reason I used mostly vintage accent pieces from the 50's (LOVE me some vintage). For nightstands I would use the classic Dorothy Draper chest with gold accents (vintage from 1st Dibs) and a black lacquered campaign writing desk (also vintage from 1st Dibs). No matchy-matchy nightstands here! I like to either match nightstands then use mismatch lamps, or mismatch nightstands and use matching lamps. These citron lamps top off the 'nightstands' beautifully! (and you guessed it, they're vintage from 1st Dibs). I have been on the look-out for elbow-length leather gloves for awhile now. I may have to settle on a pair of X-stools from William-Somona Home, that could be placed under the writing desk, at the foot of the bed, or anywhere in between. And what sophisticated bedroom would complete without drapery? I took the sumptuous feel of the skirt and interpreted it as billowing taffeta panels in grey with goblet pleats. They're the ball gown of home decor! Do you like the color palette but worried you'd tire of it after awhile? No problem. Just replace the citron bedding and lamps with your color du jour because the rest of the room is neutral. Gotta love that! This is absolutely amazing Brooke! You have such a gifted eye (that is no cousin to the lazy eye btw). I want both the room and the dress! Robin, have you seen the new book 'Women Then: Photographs 1954-1969'? I have heard amazing reviews about it and think it's right up your alley! Go Dark Or Not To Go Dark, That Is The Question. Welcome to The Modern Sophisticate!